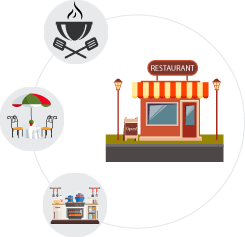 Merchant Cash Advance provides a quick financing to restaurant business owners that require working capital to develop or improve their restaurant business. It can be utilized for paying employees, restaurant renovation, addition of new service or product lines and expansion. Since business cash advance qualification is primarily based on the overall recent performance of the business and not solely on personal credit score, more business owners have qualified for a merchant cash advance than a SBA loan or business loan from a bank. Get Working Capital for your Restaurant or Cafe with Business Cash Advance. In a highly competitive restaurant industry, it is often difficult for restaurant owners to get working capital. Thus, many business opportunities are often missed. Restaurant business loans from Business Capital USA serve as an ideal funding solution for many restaurant businesses which were turned away by traditional banks for a small business loan. The flexible terms, fast access to funds and easy to qualify for working capital up to $500,000 are key benefits of working capital loans from us. A restaurant business with at least six months in service and generating monthly sales of at least $5,000 are easily approved. Unlike small business loans by banks, a business cash advance product does not require extensive supporting documentation and personal collateral. Upon approval, the business funding can be quickly deposited and available within one business day. The biggest advantage with it is the payment flexibility to accommodate seasonal businesses during low sales months. Why Choose Business Capital USA over Traditional Banks? Many responsible restaurant owners are taking advantage of the benefits of Business Capital USA business cash advance program for restaurants. They’re having success by leveraging alternative small business financing products like merchant cash advance to get working capital quickly when they need it. Secure your Restaurant Merchant Cash Advanceto address your specific business financial needs right now. Business Cash Advance from Business Capital USA was the perfect and timely choice for my restaurant business. The funding process was relatively easy and quick. It is definitely the effective way forward for small business funding. My business hit a rough ground and I was in short supply of funds. I applied for merchant cash advance for restaurants with Business Capital USA and it was fabulous to work with them. Many thanks!